You may have noticed some interesting woodwork is going up, instead of coming down, on the former Chutney’s Grille on the Hill building at 15th and Mercer — a building slated for demolition next year to make way for a mixed-use project. CHS has learned that developers Stream Real Estate are working with Storefronts Seattle to transform the entire building into an art installation project. According to Stream manager Marc Angelillo, the former Indian restaurant owners decided to leave the space before the planned end of their lease. “We did not want a vacant building and felt that Storefronts Seattle would be a positive short-term addition to the neighborhood,” Angelillo told CHS in an email. CHS has previously reported on changes coming to 15th Ave E and E Mercer, including at the Chutneys space. Greg Lewis, a Seattle-based architect, is currently working on the exterior of the building. He will be the first of three artists to work on and inside the space, according to Storefronts Seattle program manager Anne Blackburn. Lewis is slated to be done with his re-purposed wood pallet work by August 8 in time for the next Capitol Hill arts walk. Blackburn said the next two artists, yet to be determined, will work on the interior of the space using Lewis’s exterior as inspiration. The public won’t be permitted to go inside the building because Storefronts is only insured for people to view the art from outside. Blackburn said the artists working on the building’s interior will utilize Chutney’s corner windows to ensure lots of viewing space. The art will stay up until the building is torn down, slated to happen sometime next spring. The Chutney’s building presented a unique opportunity for Storefronts, Blackburn said, as the artists will get free rein over the entire building instead of just a window display. 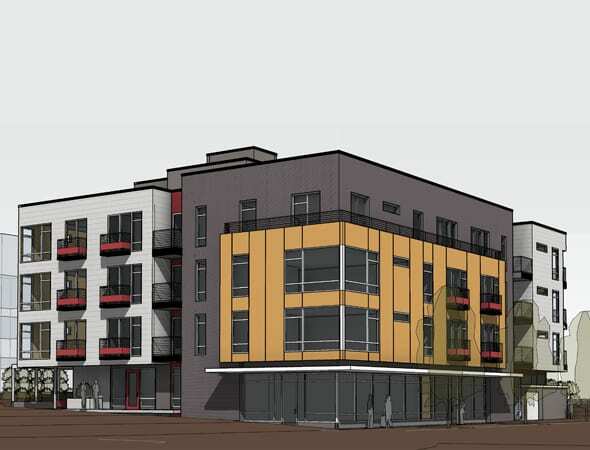 Stream purchased the building in December for $1.4 million with plans to develop it into Stream Fifteen — a new 4-story, 36-unit building with ground-floor retail. The developer is also behind the Stream Belmont project. Architect Nicholson Kovalchick, another familiar name in the neighborhood, is designing the building. This entry was posted in News, etc. and tagged art, development by Bryan Cohen. Bookmark the permalink. I love when they do this kind of stuff. I remember when the houses next to the Bel Roy were done up as art installations before they were knocked down. It was fun to walk by and see. Thanks for the update. As I noted in the other post, I was curious as to what was taking place. Its kinda weird tho as it’s the dead end for retail on 15th Ave E. Not much foot traffic at this “storefront”. I hope it doesn’t become an even greater gratified, rat-infested mess than it already is. I understand the good intentions, and it’s a nice gesture, but it’s kind of hillarious, right? Let’s make this into a beautiful art installation! And then tear it down next year and make our condo building. No, actually, doesn’t seem hilarious to me. The point is that the building is going to be vacant for a while, so instead of just having a depressing vacant blight there, why not do a temporary art installation. I agree with the earlier commenter — I think this stuff is fantastic. I loved the “mad houses” installation down on Belmont. Hopefully this will be just as interesting. I agree. Better than a vacant lot with a chain link fence. Hopefully folks respect the work. I hope they respect the work too, but am not optimistic. Graffiti vandals are attracted to an abandoned building like bees to honey, and they have no qualms about defacing works of art. Even chain link fences don’t keep them out. Jerks! well he is a fox isnt he.